In the chapter "S is for Style" I share some secrets about 'style'. 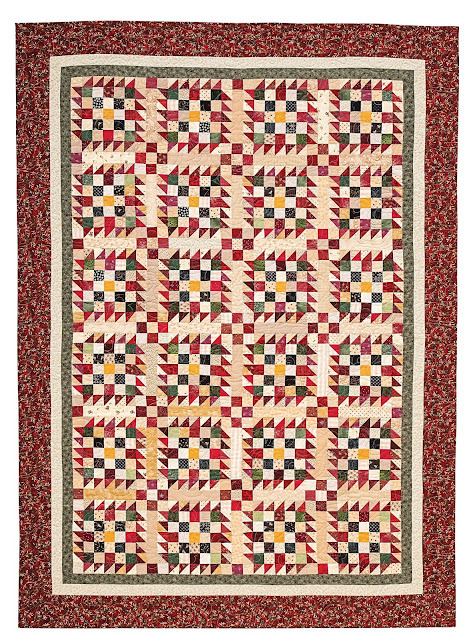 The chapter explores three different styles with a quilt example of each. There are lists of secrets about achieving each style included. These are just suggestions and ideas, basically, questions I think about or ask myself when I'm making decisions about the quilt I'm working on at the moment or during the planning process. Modern is the first style discussed. Modern is actually the hardest for me because it doesn't really come naturally to me. I love bright colors and I love fun new interpretations of classic designs, but this quilt was a challenge. I actually really like the way it turned out and that kind of surprised me. The use of simple shapes and solid colors gives it a graphic look. The bright scraps come from many many different types of fabrics, but they do share a color palette of pink, orange and yellow. All colors of citrus. This was originally going to be a row quilt, but I decided I liked the blocks offset or staggered. I still pieced it in rows, but got a completely different look. The block inspiration actually came from my scrap booking desk. I use page protectors for inserting the photos, and this is similar to one of the designs. I added a few vertical lines, and voila! Of course, the complete list of concepts and suggestions is in the book, but I thought you might like the "story of evolution" that this quilt went through. 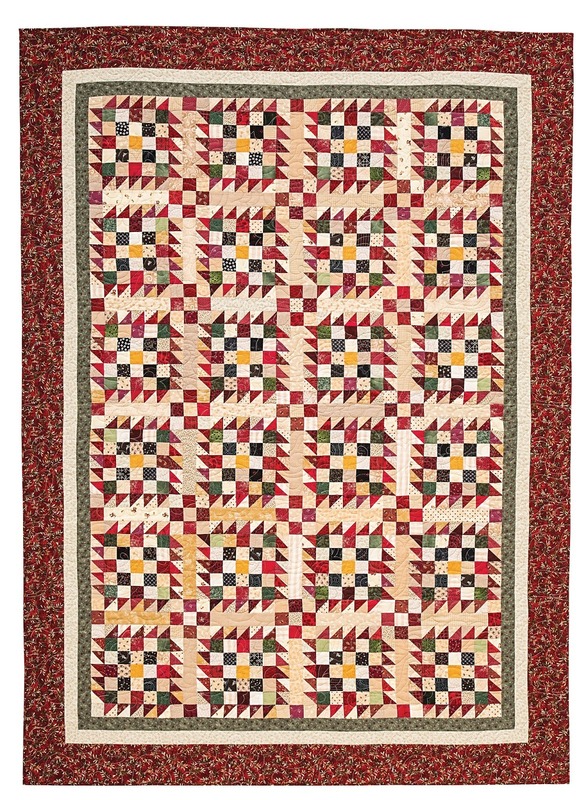 Folk or primitive style quilts really speak to my heart! I love the charm of plaids and dots and prints and stripes all together. I love the cozy colors mixed with wool and rick rack. I like how folk art style never takes itself too seriously. The 'make do with whatever is on hand' attitude of this style of quilting is my favorite. I chose three hearts because of my three kids. It would be easy to adapt that to a number that suits your family. I also think the strip below the house would be great for adding a family name or year or just initials. The best part about this quilt (in my opinion) is that it is all hand quilted with pearl cotton. This quilt, like most that I hand quilt, is first machine quilted 'in the ditch' between the blocks and borders. This serves as the basting for my hand quilting. The machine stitching secures everything in place and prevents the need for pins or basting stitches that sometimes get caught on the needle during the hand quilting process. Traditional quilts are always appealing to me. I may not make many strictly traditional quilts, but I always admire them. Some of the traditional elements in this quilt include the rows of blocks, the rows of sashing, the multiple borders and the traditional colors. Besides, what else says traditional like a bazillion half square triangles? The block can be strip pieced, I started with strips left over from several projects and it grew from there. I liked the triangles all rotating the same direction, they are not often placed that way, but I thought it gave the blocks and orderly look. Also, piecing the sashing to create additional patterns where the blocks intersects is something I love to find in vintage quilts. It is just another opportunity to do something fun. I plan to use this quilt on a bed during the holidays. While it's not strictly Christmas colors, they do dominate the overall color impact. I think I might have to play with this block again and put it on point. That would be a totally different look. You are probably more drawn to or interested in one style more than another, but sometimes it is fun to try something different. My 'secrets' are meant to help with the process. Which one are you most comfortable with? Which one do you think would be most challenging? Take some time to consider working on something that you haven't tried before. You might be surprised! Don't forget, the coloring pages for each quilt (found at the back of the book) will help you preview different color options and placement of light and dark fabrics. Its a great way to experiment without cutting into any fabric. So what style are you going to try? I must say I am drawn to the traditional style most, even if the colours and patterns of the fabrics are less traditional. 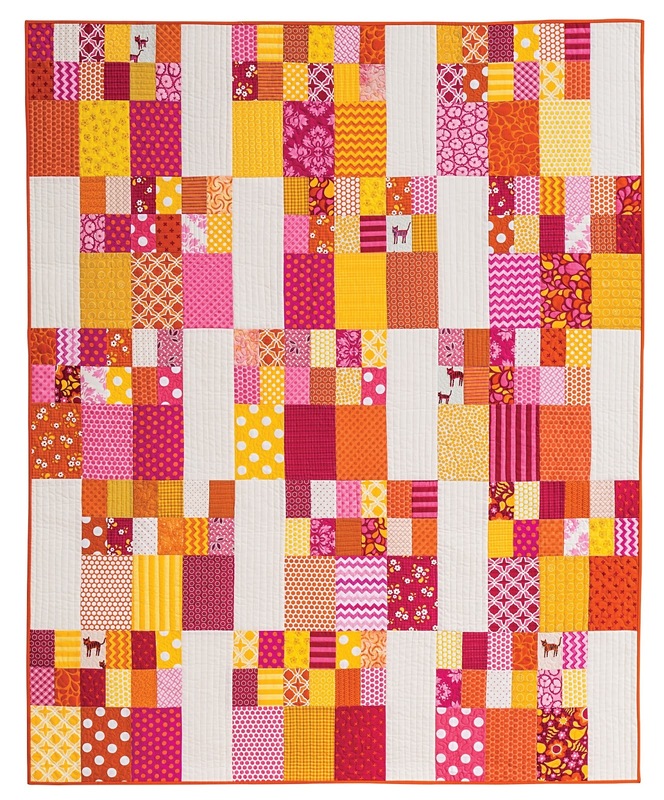 I never thought modern quilts would appeal as much to me, but your citrus quilt and the string quilt you featured in the previous post have opened my eyes to some possibilities! Thank you Diane for sharing those precious secrets of yours!